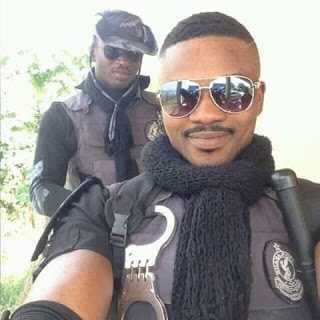 Can you still remember a a police officer, Constable Micheal Kpyori Who was killed by two gunmen in Ghana? On Tuesday, GbolaMedia Exclusive posted about the handsome Ghanaian police constable whose his name as reported to be “Micheal Kpyori” who is serving at the Rapid Response Unit in Tema was gun down by two unknown men on bike. Goodnews! The Ghanaian police officers has revealed that they have also killed the suspected gunman who gun down one of their comrade, Constable Micheal Kpyori last Monday when he was on patrol duty at Micheal camp in Greater Accra Region. The police were able to get the suspect when they acted on intelligence and fortunately for them, they find out the suspect hideout at Talaku in Ghana. According to Accra-based Citi FM, when the police arrived at the suspect hideout in Talaku at around 3:00pm on Tuesday, the suspect on seeing them shot one of the police officers while the police officers swiftly responded by firing back at him while the suspect finally gave up to ghost. The suspect is popularly known as “Dogo America”. He had been on Ghanaian police “most wanted list” for some times. After killing the Dogo America, the police officers also arrested five other suspects including Dogo America’s wife and two AK47 guns and some ammunitions was also recovered.